To the rescue! 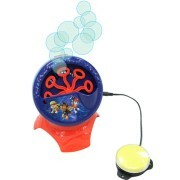 Activate your capability switch and the moving wands blow continuous bubbles for tons of bubble fun. Three of your Paw Patrol buddies are featured on the front. Great for visual tracking and just plain fun. Includes 4 fl oz of premium bubble solution. Size: 6"L x 5½"W x 7"H. Requires 4 AA Batteries. Weight: ½ lb.